Allow customers to enjoy the thrill of being up high with a low rate of refusals. An exhilarating experience with a high throughput of customers. An extraordinary and original way to conduct tours of venues. Abseils & Fan Descenders allow customers to descend from buildings in a memorable, exhilarating fashion. We will work with your team to produce an inspiring, original plan for your Urban Aerial Adventure. We will strive to ensure that your attraction is fun, safe and profitable. Zip Wires, Walkways, Abseils, Rapid Descents. Wire & Sky can project manage and build Urban Aerial Adventures that fit your requirements. Wire & Sky can install a complete Urban Aerial Adventure. Working with our partner riggers, IRATA professionals and engineering consultants we will write RAMS and work at height, installing your Urban Aerial Adventure to the required specifications. Wire & Sky holds specialist insurance with which we are able to design, build and operate Urban Aerial Adventures. We hold this insurance because we are appropriately qualified and experienced. 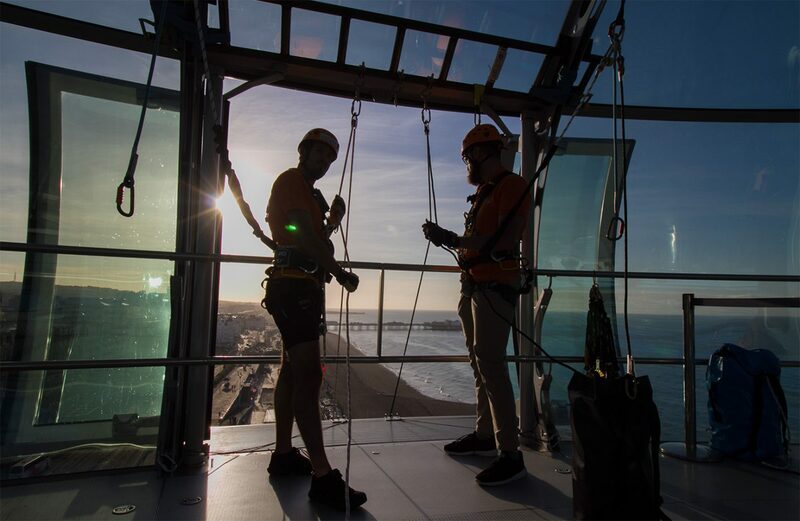 We will conduct full safety testing of all elements of your Urban Aerial Adventure, prior to opening to the public. We use an international, renowned structural engineering firm for all structural calculations in order to ensure all adventure elements are as safe and robust as possible. They are always happy to liaise with your structural engineers & architects. Over the course of the installation, Wire & Sky will produce the relevant documentation required to operate the attraction. This will include: Operations Manual, SOPs, EOPs, Risk Assessments & full operational evaluation. Unparallled experience in urban adventuring, Create tuly memorable experiences. Safety Procedures, Ticketing, Merchandising, PR, the Customer Experience. We will work with you to make sure you are ready to hit the ground running. This will ensure that customers are satisfied from day One. Here is an outline of how Wire & Sky might deliver your Urban Aerial Adventure Attraction. Wire & Sky are experienced in developing nationally-renowned visitor attractions. We will ensure that your Adventure receives the very best customer feedback, thus promoting further ticket sales & merchandising opportunities.